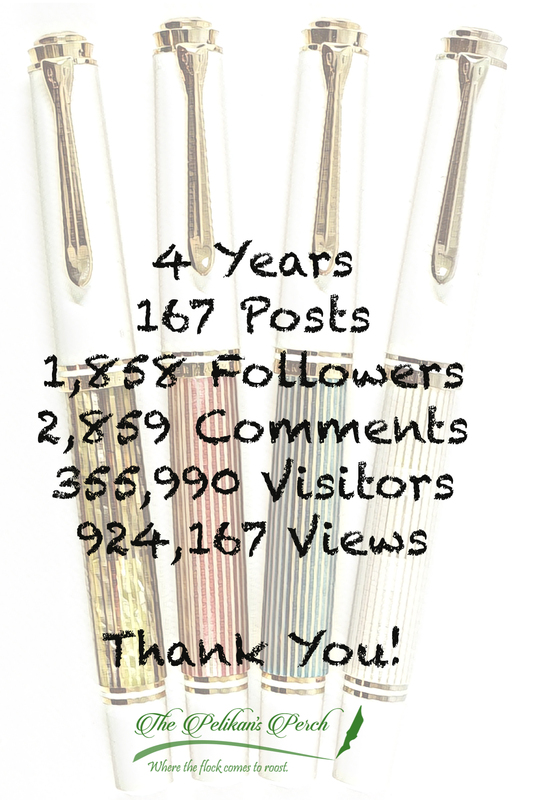 The Pelikan’s Perch turns 4 years old today! No longer a toddler, part of me still cannot believe that the site is going strong and continuing to grow year after year. I can only attribute that fact to my love of the brand, the great products Pelikan puts out, and the support of all of you, without which none of this would be possible. My blog was born from a desire to share the knowledge and perspective that I had gained in researching my favorite fountain pens. I wanted to give back to the community that empowered me in my quest and fostered my love for fine writing. All I can do is say thank you. Thank you for reading, for sharing my work, for interacting and contributing to the conversation, and for four great years. To celebrate this anniversary, I have decided to host the first ever contest to grace The Pelikan’s Perch. In trying to decide just what type of prize to offer, I reflected back on my own collection. In doing so I realized that the Pelikan P16 Stola III fountain pen would be well suited for the task at hand and entering for your chance to win one couldn’t be easier. Read on to learn about all of the details.